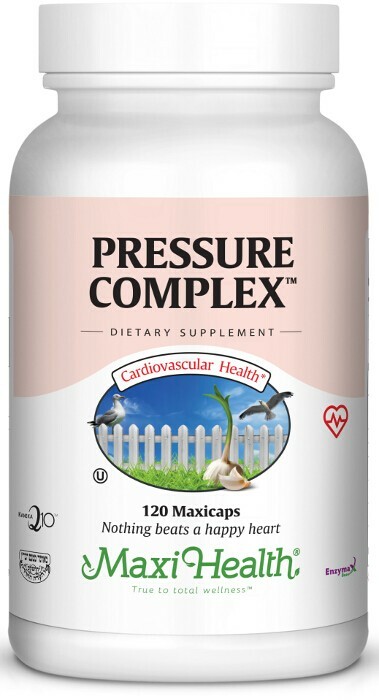 With Maxi Pressure Complex™ you get Co Q 10, Garlic, Magnesium, Potassium, Vitamin B6, Potassium, Magnesium, Vitamin B6, Inositol, Taurine, Juniper Berry, and Parsley Powder, Uva Ursi leaf powder, and Cinnamon Powder. Try it today! Refrain from use of tobacco products in any form to avoid narrowing of the arteries which can ultimately lead to a heart attack. The Increase in fruits, vegetables, and whole grains in the diet has been recommended by leading cardiac health professionals and organizations. Take three (3) Maxicaps™ twice daily with meals, or as directed. Other Ingredients: Vegetable cellulose, magnesium stearate, Enzymax® (calcium carbonate, bromelain, papain, lipase, amylase, protease, silica). Enzymax®, a vital digestive enzyme complex, is a regis-tered trademark of Maxi Health Research® LLC. KanekaQ10™ is a trademark of Kaneka Corporation.